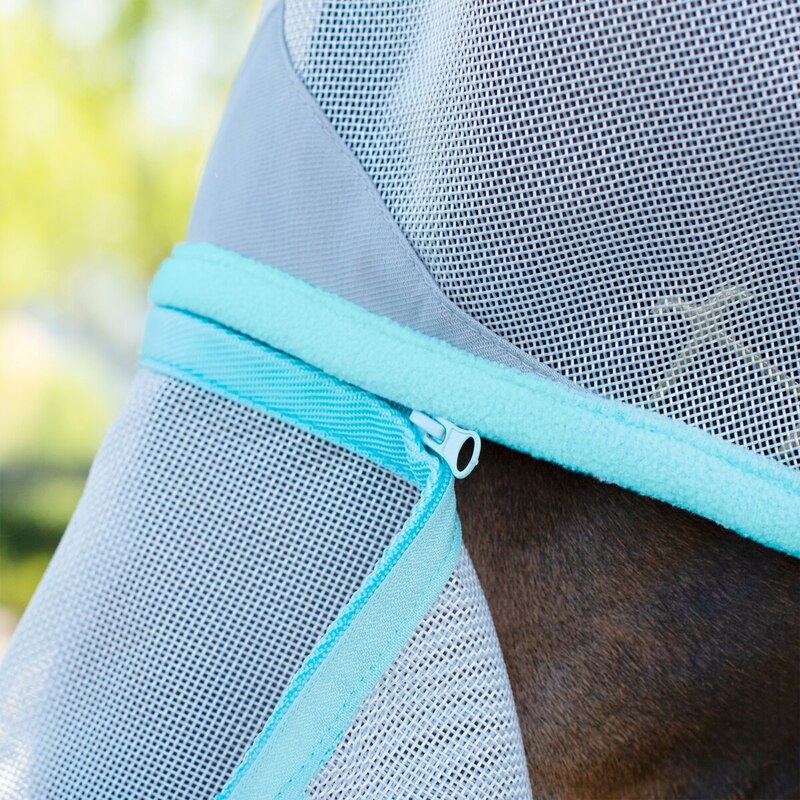 The SmartPak Deluxe Fly Mask is just what your horse needs to keep summer's pests at bay at a price you'll love! 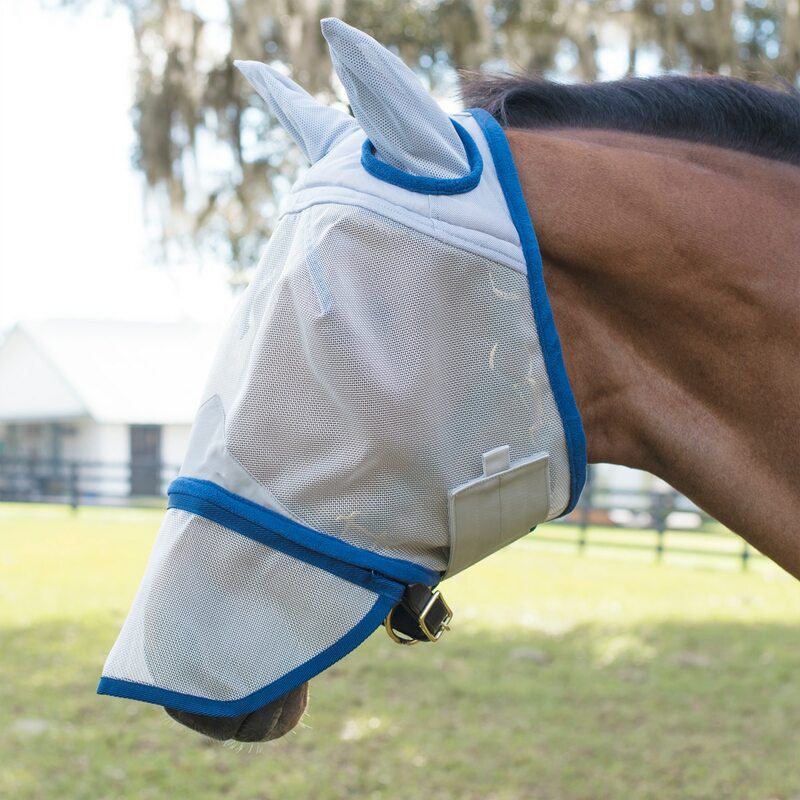 The Deluxe mask features a fleece bumper in the crown to help lift the mask away from your horse's eye as well as a removable zipper nose piece depending on you and your horse's preference. Available in cob and horse. SmartPak Deluxe Fly Mask is rated 3.9 out of 5 by 35. Rated 1 out of 5 by justjump42 from Not what I had hoped... I bought these masks last year for my 3 TBs. I have had great luck with the classic style SmartPak mask, but needed the long nose. I ordered the average horse size, which is their usual size. The masks were too big. As always, exchanging the size was easy, (Thank you!) so I got the cob size. They were too small for 2 of the horses. I decided to keep all of them for the 3rd horse. I am glad I did, he went through all 3 masks by the end of the summer. The zippered nose broke within days on all 3 masks. Also, the velcro did not hold up to keep the mask on. I ended up having to buy a 4th mask for my horse by the end of the summer. 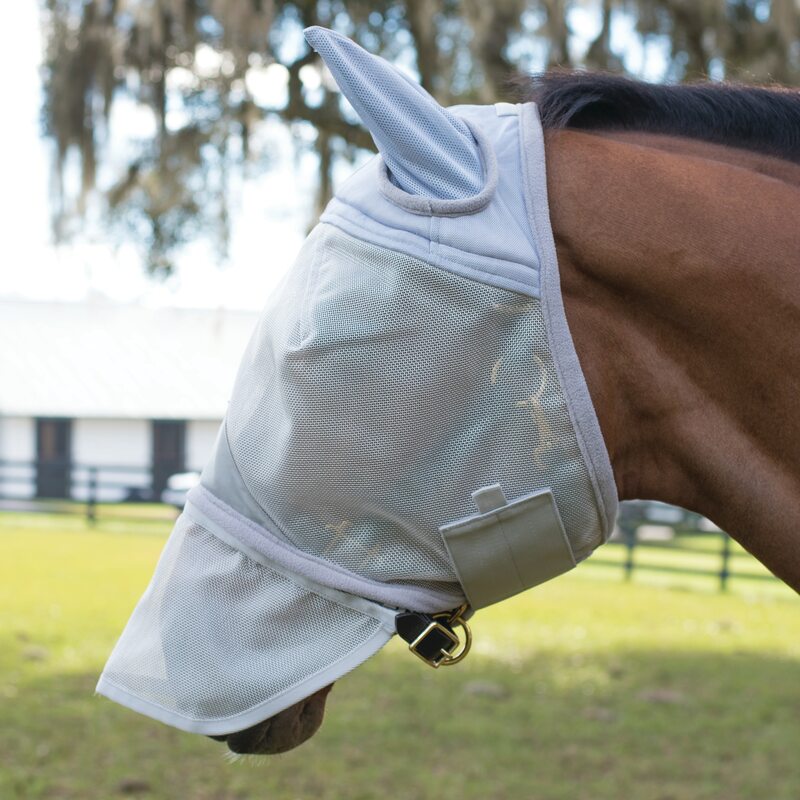 Rated 3 out of 5 by Andrea from Good fly mask, Poor zipper I used this on my horse for about 1 month. 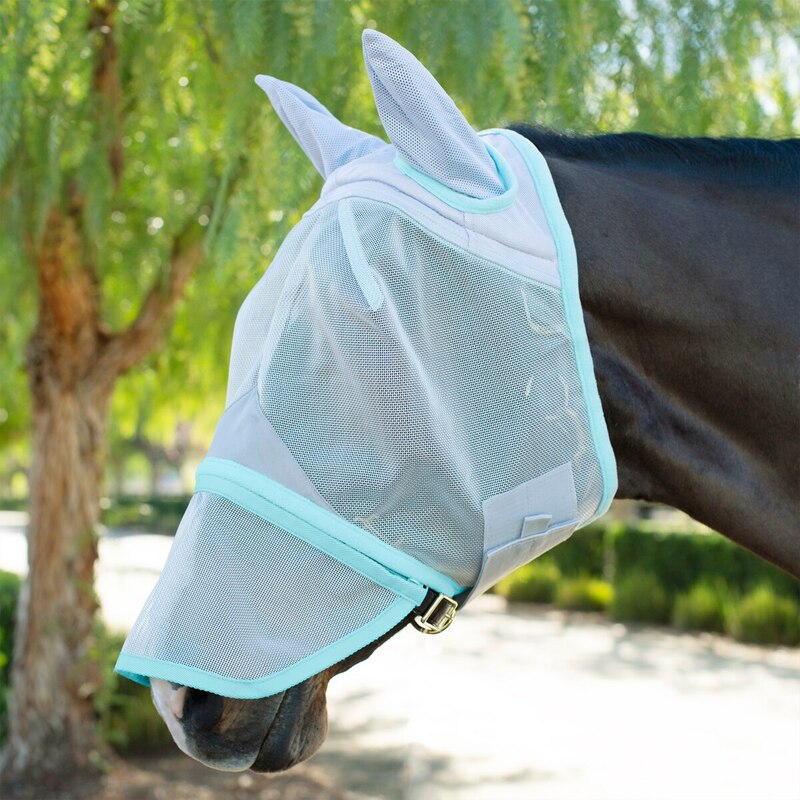 My horse is in a large outdoor paddock and is not harsh on fly masks at all. They usually last him 3 to 4 fly seasons and then I have to switch due to the velcro not sticking very well anymore. The actual fly mask is really nice and I liked the wide velcro strap and the long nose portion is nice. The only problem I had is that the zipper slider actually came off of each side of the zipper teeth. I was not able to reattach it no matter how hard I tried. Each piece of the fly mask was still in perfect condition so I have no idea how it came apart. I have to have a long nose on my horse's fly mask because he has a completely white nose and his nose ends up with a sunburn without it. I called SmartPak and at first they did not want to replace it. After I spoke with a second representative they actually replaced it (with a long nose crusader fly mask since they were out of the SmartPak fly masks) for free and had it embroidered for free (I had paid for embroidery on the first one I ordered). I am really happy with the ending result from SmartPak replacing the fly mask. 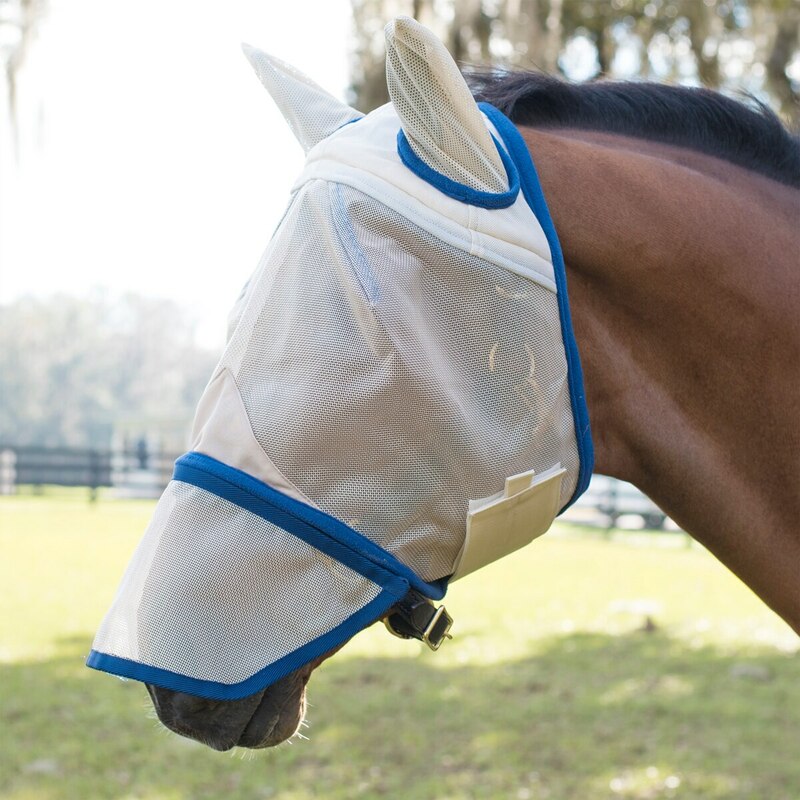 Note: The actual fly mask is great and I am actually using it on another horse now but I would not use it with the long nose portion since it does not seem durable. Rated 5 out of 5 by hollishancock from Amazing My new favorite fly mask, 100% recommend, very durable and nice, my pony loves the soft padding on the inside!! Rated 5 out of 5 by Kathleen from Very durable but soft no rubs I bought one to try for my TB that is rough on fly mask. It held up to him so I bought two more for my other two geldings that are out 24/7. I like the soft padding and removable nose although I won’t be taking that off! Rated 3 out of 5 by KatieM from It’s decent! My gelding wore it everyday and by day 15 the ears had holes in them and his ear pokes through. I like the one strap and the fleece but the soft mesh for the ears tears easily; especially if your horse is in a large turnout like mine! Rated 5 out of 5 by Kathleen from Great quality no tears! Bought for my TB gelding hat is tough on fly masks. This is the nicest quality and toughest purchases. I really like this one. I bought with ears and nose. Good job SmartPak! Rated 4 out of 5 by Megaafreshh from Slides off, no forelock hole I have a gelding who likes to rub his face when he rolls. I bought this mask because I have an older Smartpak flymask which I love. This one does not have the double velcro closure which is too bad. I'd say I find it in the paddock (still closed, just slid off) about twice a week. Also wish there was a hole for the forelock. Rated 1 out of 5 by Tulipcat from Fell apart after using less than 1month Extremely disappointed! I have only had this in my filly for less tha 1month. The nose guard has ripped off and the rest of it is shredding. My filly lives alone so it’s not being pulled off by another horse. Her previous one lasted until she grew out of it! Rated 2 out of 5 by Emily2553 from Wide Velcro Left Rubs Despite the mask fitting my horse like the picture shows, my horse was left with massive rubs on her face from the wide velcro strap from only 2 nights of wear. The lack of elastic makes it too unforgiving. However, I did like the fleece and the zippers.